Chile is an essential ingredient in the northern New Mexican cuisine. But not all chile sauces are created equal. Should they be vegetarian or have a pork base? Which one is better, red or green? These questions are answered here by restaurateurs, chefs and managers who use chile, in all its permutations, daily. Voted Best Mexican Food in TaosCounty since 2005, Orlando’s New Mexican Café, about two miles northwest of TaosPlaza, is well known for its creative uses of chile in a variety of recipes. A very special one is the vegetarian red chile, which is made following a secret recipe by Delfina Archuleta, the owners’ grandmother. “All the chile that we use here is grown in Hatch, New Mexico,” said Orlando’s manager Felisha Rascon. “We use three main kinds of chile—caribe, red and green, and a combination of red and green known as Christmas.” The caribe, made from dried red chile pods, is the hottest one and has a distinctive smoky flavor. She recommends the smothered chicken or beef burrito, one of Orlando’s signature dishes, which is served completely covered in the chile sauce of your choice. When accompanied by green chile, its pungent flavor makes the taste of the cheese that tops the burrito stand out, creating a New Mexico culinary delight. 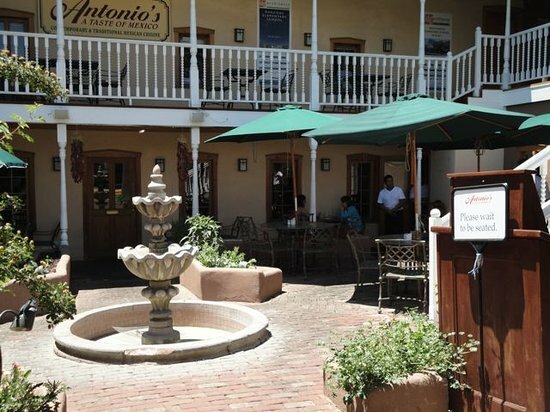 Another “Best of Taos” winner is Antonio’s, located next to Our Lady of Guadalupe Church. Antonio’s has won first place for best red chile by the Taos Chile Challenge in 2012 and second place for best green and red chile in 2011. Though Antonio’s specializes in Mexican food, it also offers New Mexican dishes like chiles rellenos de queso, made with a fresh Hatch green chile stuffed with Monterrey Jack cheese and covered in red, green or Christmas sauce. Antonio is from Veracruz, so this is not your typical northern New Mexico restaurant, explains Roybal. “We have some interesting dishes,” she said. 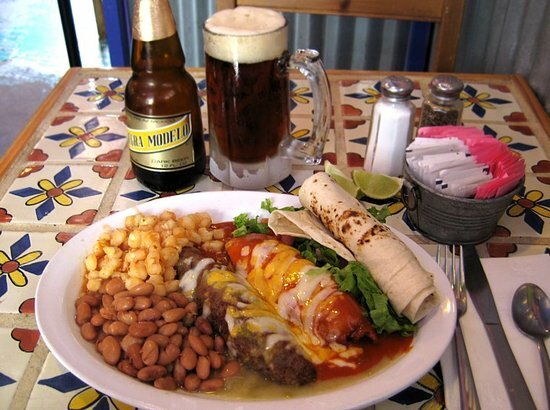 Personally, Roybal favors chimichangas, made with chicken, beef or pork, smothered in green chile. Juana and Horacio Zarazua are the owners of La Cueva, located at the corner of Paseo del Pueblo Sur and Quesnel. They prepare all their chile-based dishes with gluten-free flour. They also follow a totally vegetarian recipe. “We mix and match Mexican and New Mexican recipes, and try to use as many fresh ingredients as possible,” said Horacio Zarauza. Its combination plate of a chile relleno, a chicken enchilada and a beef taco covered in red chile has just the right blend of spiciness and crispiness. Right next to the San Francisco de Asis Church is Ranchos Plaza Grill. Adam Medina is the owner, the chef and a native Taoseño. He says that both his red and green chile sauces are made with ground pork, though he also offers vegetarian green chile. His perfectly puffy sopaipillas are stuffed with beans and beef and topped off with sour cream, guacamole and a sprinkle of cheese. They are delicious when covered in red chile. Stray Dog Cantina, at the base of TaosSkiValley, offers completely vegetarian red and green chile. Their green chile cheeseburger is by far the favorite meal on the menu by both locals and visitors alike. “The green and blue burger, made with green chile, bacon and blue cheese is just our twist on the original and it’s delicious,” said Griego. My favorite dish there is Local Loco, inspired by the Hawaiian dish Loco Loco. Not yet sure about red or green, meat-based or vegetarian? No problem, try them all!